Throughout history clowns have been around to entertain us. Whether they be in the form of a court jester, or the kid who loved interrupting class with ridiculous puns. No matter the form of clownin' around it has always been something cherished. A favored clown through history has always come from the circus. Who doesn't love the gag where twenty big clowns hop out of a tiny car? How the heck did they even fit in there? If you are a fan of balloon animals then clowns are your go to dudes. Yes, they can be obnoxious just like the class-clown back in grade school. However, they can be tons of fun with their cheerful dispositions. Who doesn't love some fantastic family entertainment of a clown dancing in his giant shoes with huge hair swaying in the wind? Hop on your unicycle and get ready for the ultimate costume for clownin' around. 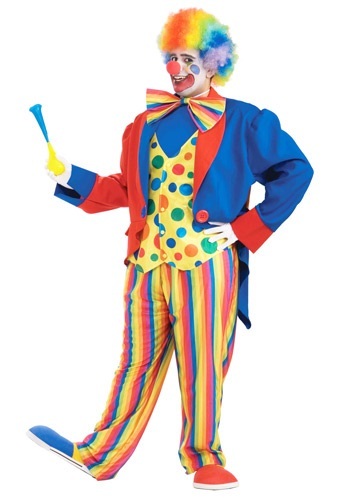 Bring out your inner clown in the Plus Size Mens Clown Costume. The costume includes a blue, red, and orange jacket, with an attached yellow button up vest adorned with colorful polka dots. A rainbow bow tie with an elastic band fastener to be worn around the neck. And to cover the nether regions, colorful rainbow pants with an elastic waist band. Just add big shoes, make up, a red nose, balloons, a tiny car, a unicycle, for a classic circus clown look.